Keep your Property Staff Connected. Resort properties typically have several groups of staff members that need to have communications separate from one another, so radios that support multiple channels are recommended. This would allow the cleaning staff to have their own channel, separate from maintenance. If the front desk needs to send the cleaning staff to a room, they can simply switch to the “cleaning” channel before talking. Managers or other staff members needing to monitor all communications can simply enable "scan mode" on their radios to monitor all activity. Get the Kenwood advantage today. 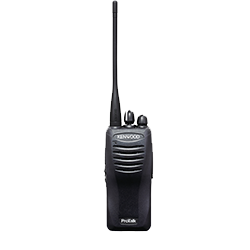 Recommended radio for Property Management Communications.